Munich based Velvet Mediendesign and Spanish based Axis Films teamed up with Stiller Studios to shoot this 75sec. rollercoaster spot for Spanish insurance company Ocaso. Studio released Behind the Scenes of TVC Ocaso VFX. One of the most complex synchronised Cyclops motion control and Motion Base projects to date. All shots motion control simulated, planned and VFX optimised by Stiller Studios, using Autodesk Maya and Nuke by The Foundry. Commercial was directed by Matthias Zentner, spreads the Ocaso-safety-net all the way from childhood to the sunset years, highlighting the emotions and addressing the most spectacular life moments. In an alternation of objective narrative and POV´s the story gets more thrill. Based on a precise motion revisualization, the corresponding backgrounds and action scenes where shot in Barcelona and Northern Spain with the furious technical tools from Movi on Segways over to helicopter, and race drones in order to captivate the feelings of a real motion ride through nature and city. 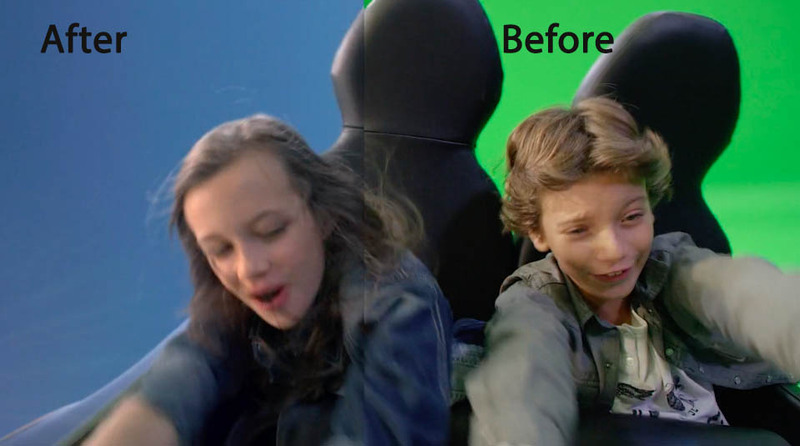 The mixture of the previs, combined with the edited background clips, formed the base for the progress of the rollercoaster ride into the given motion tracked background footage. The rail tracks and carts were designed in CGI and a simplified prop-cart-model was build to get a credible integration of the main actors acting quality. The cart model was rigged on the motion base in green screen Stiller Studios in Sweden and all the 3D FBX animation data were then synchronized with the motion base and the cyclops motion control for the 2nd part of the shooting. Motion Base is a part of our robot family at Stiller Studios. This video gives a glimpse of how it can be used. Cyclops is a part of robot family at Stiller Studios. It is the heart of the set-up.